Researchers in the University of Toronto's Faculty of Applied Science & Engineering studied the eye movements of drivers at busy Toronto intersections and found that more than half failed to make necessary scans for pedestrians or cyclists at right turns. 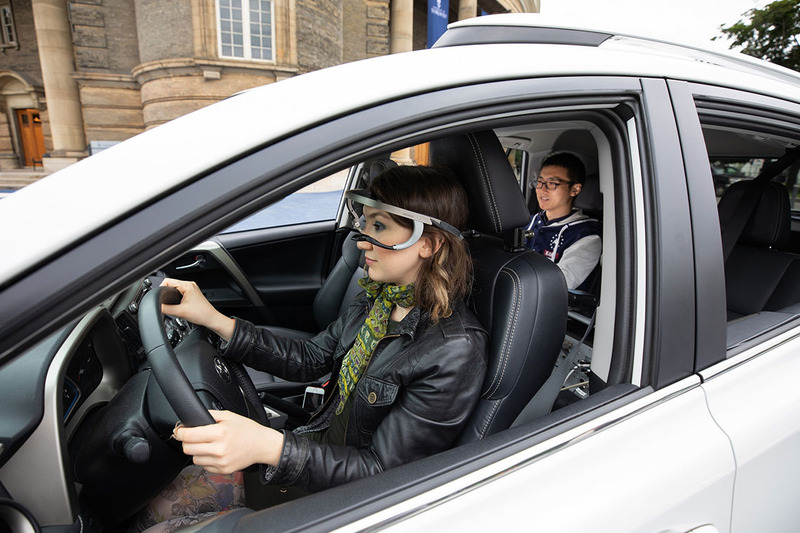 It is the first study to date that used eye-tracking equipment to accurately assess where drivers were looking when turning at an intersection. During a summer that has seen a string of vehicle-pedestrian and vehicle-cyclist collisions in the city – with 21 fatalities as of June – the study gives new insight into a driver’s misallocation of attention when making turns on busy city streets. “There are a lot of visual and mental demands on drivers at intersections, especially in a dense, urban environment like downtown Toronto,” said Nazli Kaya, a master's candidate in mechanical and industrial engineering who is leading the research under the supervision of Birsen Donmez, an associate professor and Canada Research Chair in Human Factors and Transportation. “Drivers need to divide their attention in several directions, whether it’s other vehicles, pedestrians or road signs and traffic signals – traffic safety instantly becomes a major concern,” she said. There were more failures turning onto Major Street, due to parked vehicles blocking drivers’ views of the bike lane.